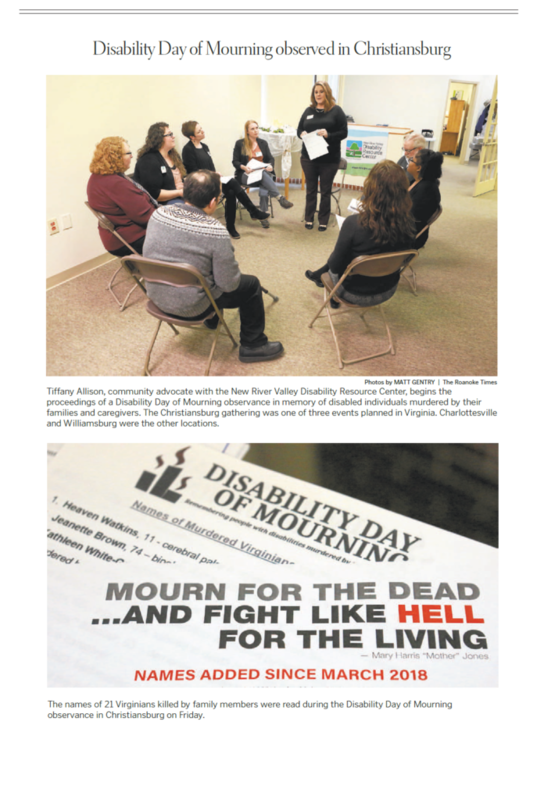 On Friday, March 1, the NRV DRC held a candlelight vigil to memorialize those who have been murdered by family members or caregivers due to their disability, a crime known as filicide. The event brought in numerous people from the New River Valley, and local media coverage attended to report on the memorial. The afternoon of events included signs, speakers, a reading of names of those who have been murdered, and literature on filicide and how to advocate against it. Several links to media coverage are below. We wish to thank WSLS10, WFXR, the Roanoke Times, WUVT, National Public Radio, and the Radford News Journal.